The will of the British people? | A balanced diet . . . The will of the British people? A common (but misleading and annoying) refrain, frequently repeated by Prime Minister Theresa May and other Brexit supporters, is that delivering Brexit is ‘the will of the British people’, respecting the vote of the June 2016 referendum. Delivery of Brexit and hang the consequences! Will of the British people? Whatever does that mean? And who are the British? Yes, the Leave campaign was supported by more voters, 52:48% and ‘won’ the referendum. However, only 37.4% of the electorate (of 46.5 million) actually voted Leave. Not even 50% or more. Had they supported Brexit to that level then it would be appropriate to make that claim. As it is, it’s just a ridiculous platitude that Theresa May repeats ad nauseam. So voting to leave the EU was the will of the British people? Well, let’s see how they voted. 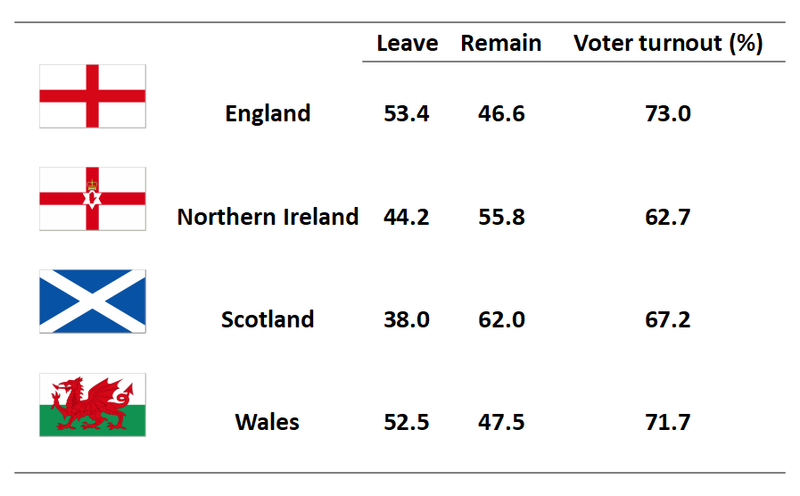 Actually, voting to Leave was the will of a majority of the English and the Welsh, although listening to the antediluvian Democratic Unionists of Northern Ireland, you might be led to believe that the Province also voted overwhelmingly to Leave. There is now strong evidence that voting preferences have changed (in favour of Remain) since the referendum as the potential impact of Brexit (especially a No Deal Brexit) has dawned on a naïve electorate. L: the actual results of the 2016 referendum by local authority. R: voting intention in a Channel 4 survey in November 2018, by local authority. 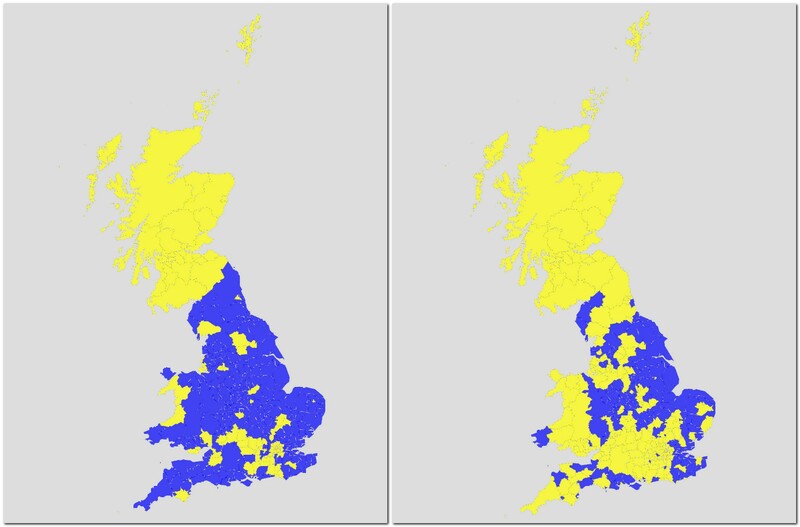 Yellow = Remain; Blue = Leave. Naïve? Just listen to these British expats who live in or frequently visit Spain. I feel embarrassed (ashamed even) to be part of the same age demographic. Immigration was a serious driver of the Leave result. I find it incredible that so many voters thought that ending free movement (under the Single Market, if they indeed ever understood what that was) only applied to those EU nationals coming into the UK. Not to the British moving around the EU! And, regrettably, ‘British’ is often perceived (especially by those on the Far Right of politics) simplistically as white English. As I recently wrote, Brexit perspectives will be forensically dissected at some time in the future when the histories of this debacle come to be written. If the UK crashes out of the EU without a deal, I believe (and fear) the United Kingdom will soon disintegrate. And this once proud, but increasingly impoverished nation, will descend to a state of insignificance on the world stage. Scotland will, in a second referendum, overwhelmingly vote for independence. And who could blame them? 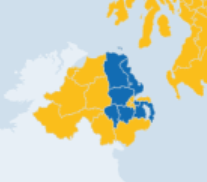 Northern Ireland will, within a decade, probably draw even closer to the Irish Republic. I’m not sure about Wales. Brexiteers (predominantly Tory English MPs) continue to see a role and influence of the UK projecting ‘neo-colonialist’ power (‘lethality’ even) far beyond what this small island nation with a shrinking economy can hope, or should ever again aspire, to achieve. Just take the ludicrous comments of Gavin Williamson, MP for the South Staffordshire constituency and the miserably inadequate Secretary of State for Defence, just a few days ago. And on the trade and diplomatic front, things aren’t going so well either. What is also lamentable right now, is that the ‘will of the people’ appears to be cast in stone. Theresa May can bring her failing deal back to Parliament for multiple votes, yet hypocritically denies the electorate the opportunity of comment on the outcome of the Brexit negotiations through holding a second referendum or so-called People’s Vote. With only 39 days left to Brexit, and nothing clearer appearing on the horizon, it’s about time to recognize that the will of the people has changed. Politics in the UK is broken. Party politics (and survival) have taken precedence over the well-being and future of the country. I’m a citizen of the United Kingdom, British by nationality. I’m British from England, and I want my British voice and will to be heard and felt along with those from Brits from Scotland, Northern Ireland, and Wales. I feel and am European! This entry was posted in In the news, On my mind . . . and tagged Brexit.